Welcome to Tal Productions and Entertainment. 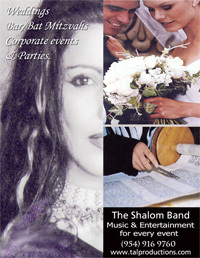 At Tal Productions we specialize in matching music and entertainment for every and any event. Weddings, Anniversaries, Bar/Bat Mitzvahs, Community Events, Corporate Functions, Dinners, Dance Parties, Private Parties and more. We believe that the success of a party is directly connected to the music. We are here to orchestrate the entertainment by providing the perfect musical performance for each and every event. All events are custom designed to meet the needs and budgets of our clients. We believe that music is the beating heart of every event.